Home » 15-16 Offseason » Terry Collins: Greatest Manager Ever? Wasn’t it completely unthinkable that the Mets would have a winning season, much less make the playoffs? Much less, go to the World Series? OK, I guess Collins’ chances were somewhat hurt by the timing of the voting. Perhaps if ballots were cast just prior to the World Series, rather than prior to the beginning of the postseason, he would’ve won in a landslide. But still, didn’t the Mets wildly overachieve? Doesn’t the manager get some credit for that? No, Terry Collins isn’t known for the “X’s and O’s” of baseball field leadership. But he does make the lineup cards (or does he?) and call in pitchers from the bullpen. And really, baseball managers are more about leading men, rather than in-game management — which is pretty much push-button based on sabermetrics these days, anyway. 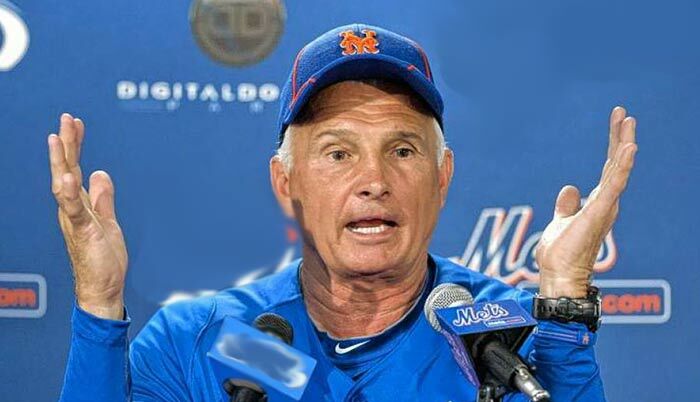 So the question remains, how did Terry Collins not win NL Manager of the Year? – Voters may believe that Collins had nothing to do with Yoenis Cespedes‘ transformation into Babe Ruth for a roughly six-week period. Some believe that Cespedes carried the Mets on his back from mid-August through the end of September; mysteriously, none of those people still believed that after Cespedes went ice-cold in the World Series. – Voters think that Collins had nothing to do with the epic collapse of the Washington Nationals, nor the Nats’ front office’s decision to do absolutely nothing as the walls caved in around them. These are the only theories I can come up with. Last I checked, the Mets weren’t supposed to win more than half their games — and 81 wins would’ve placed them two solid games behind the 83-win Nationals. Instead, the Mets won 90, despite having no offense, horrendous defense, terrible baserunning, unreliable middle relief pitching, and severely lacking in fundamentals. How can a team so challenged make it to the World Series? The only reason I can come up with is that they were led by the greatest manager in the history of baseball. That’s right, someone even better than Manny Acta. Have a better explanation? Post it in the comments. I can’t remember which celebration it was — division, NLDS, or NLCS — but some reporter asked Collins about the turning point in the Mets season, and I really liked Terry’s answer. Rather than bringing up Cespedes or the obvious sweeps of the Nats, Collins talked about how the team didn’t tank in June when everyone was hurt. I think he’s right! At the time, I was underwhelmed by the team, and didn’t see hanging around .500 as much of a victory. But then the season wore on, and I saw how the Braves and Phillies did with their depleted rosters. In retrospect, winning most of the games their defense didn’t give away in June was an important achievement for the 2015 Mets! I would guess that intangibles played a part. The Mets mostly avoided defeatist body language. They didn’t always play smart, but they did play hard. Who to credit for that? I’d say the #1 responsible party was the players in the clubhouse, but #2 might be the manager. Agreed. There hasn’t been a manager in the history of MLB that hasn’t done some head-scratching things at one time or another. Collins has had his teams play hard, even with limited rosters, and he got them to the finals the one year that he had some horses. The others can have the awards.